1 ) Where did you Grow up and how did you first get involved in writing? Why did you choose the name FRITZ? I grew on Bronx Blvd and Gun hill Rd in the Bronx. My friend Jingo 222 got me in to it, He moved to co-op city and hit all the buses. That's how I got started The reason why I chose the name Fritz is because my friend Eddie used to come up with a different name every week and he told me that he looked in the dictionary to get the names so I followed the same concept and when I opened the dictionary an put my finger in a random page it ended up over the name of general from world war I, my finger was on the word FRITZ that was part of his last name. 2 ) Do you recall the earliest names you have seen on the Subways and what writers inspired you the most? 3 ) Could you tell us the first time you hit the Subways, where was it and what was that experience like? The first time I hit the subways was about early 1972 and It was on the 225th street lay-ups on the 2 train. It was an exciting experience to do something sneaky like that and not to get caught. 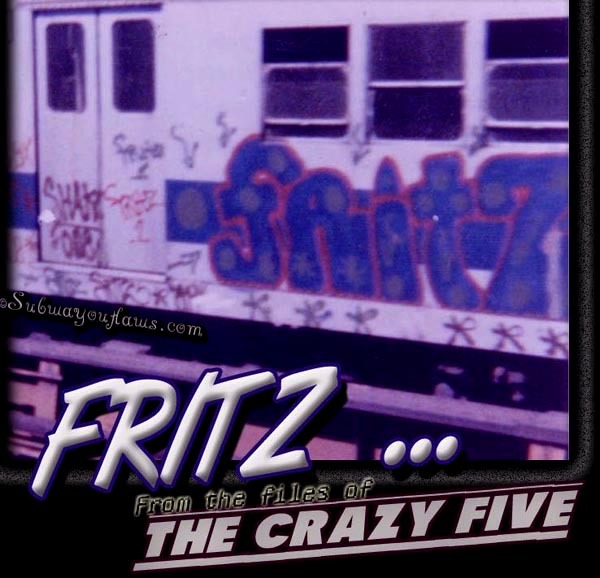 4 ) Could you tell us how the crazy five started and who were the original members and who were some the guys that came later? 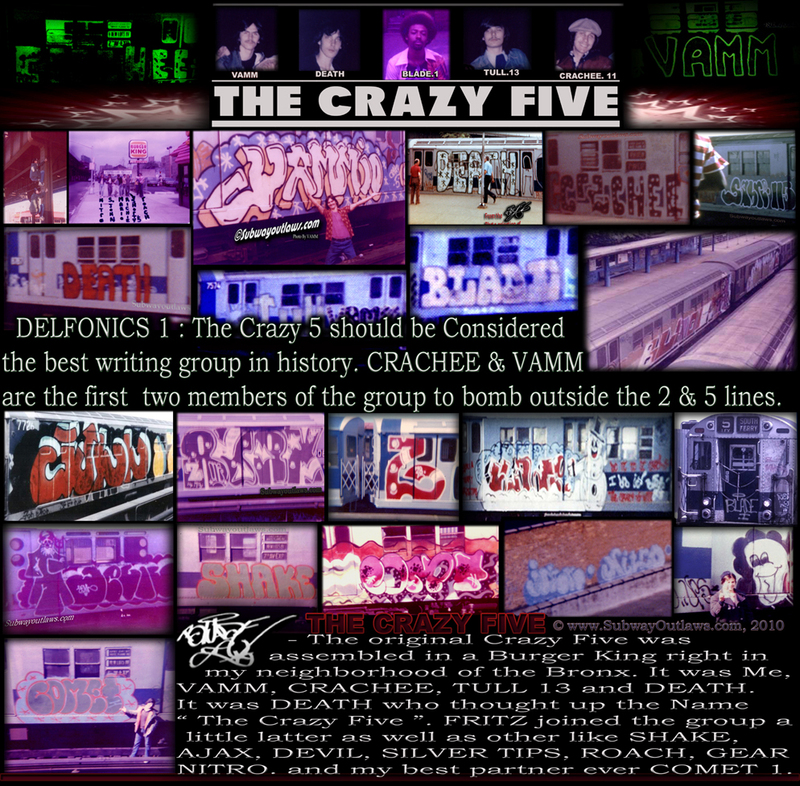 I can not recall how the group started because unfortunately I wasn't one of the original Crazy 5, but I do know that the original members were BLADE 1, VAMM 1, CRACHEE 11, DEATH, TULL 13 / MARIO. Some of the guys that came later were AJAX 1, DEVIL, COMET 1, SHAKE, NITRO 1, SILVER TIPS, ROACH, GEAR, DEVIL, SANTANA and myself just name a few that I can remember. 5 ) Would you have any racking adventures you could share with us? The only thing I can remember is that AJAX 1 and I use to go downtown to 72nd street and Broadway. Spending the whole day there walking up and down the both sides of Broadway and racking up on cans of paint and other things. We pinned up our jacket sleeves put the jacket over our shoulder slip the cans in the sleeves and walk out the door some stores we would go back in twice. 6 ) What are all the Subway lines you hit and what lines did you focus on the most? The lines we hit the most were 2, 4 and 5. The line I focused on the most was the 2 line because that one passed by my house. 7 ) Other then the crazy 5 what are other writing Groups were you a member of during the same time? 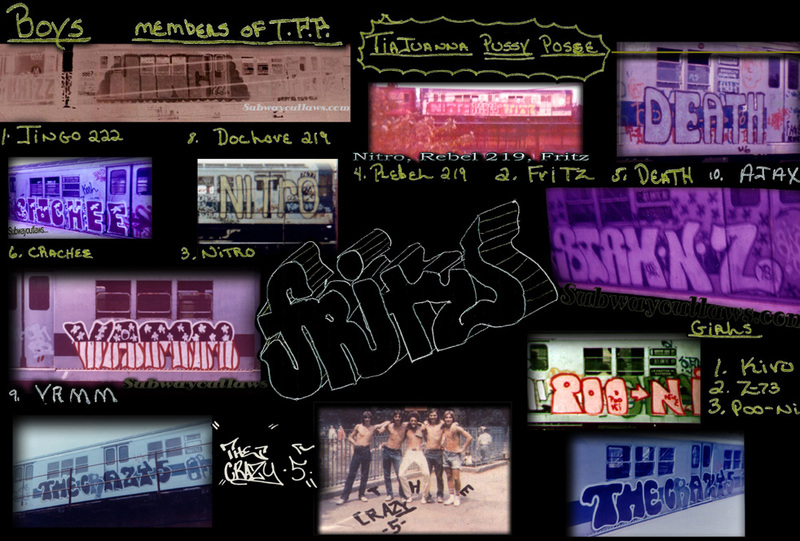 The first one I was ever in was just a local one in my neighborhood that you provably u have never heard of, it was called TPP and also I was part of the Nod Squad with the slogan "We smoke the herb, we drink the wine with the Nod Squad 219." After those 2 groups I met the crazy 5. There were other writing groups who were also big on the trains in my day like T.E.D -inc ( The Ebony Dukes ), I.N.D's ( The Independents, Ex/Vandals and Wanted Tracy 168's crew. 8 ) The buses were very big in the early 1970's, did you ever get up on the buses and where were your favorite places to catch the buses? I never really hit that many busses but the ones that I did were in Co-op City. 9) The gangs were very big in your era, what were the biggest gangs during your era and did any of the gangs ever cause a problem for you when getting your name around? The gangs in my era were the White Angels and the Black Spades and luckily none of them ever bothered me. 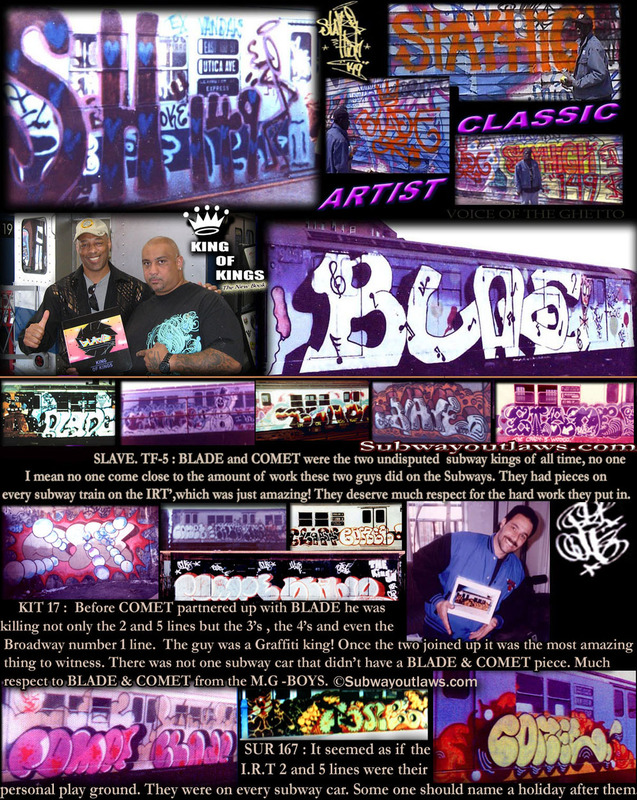 BLADE : FRITZ was originally from 219th street and began writing with the likes of SHAKE , COMET, SILVER TIP's, AJAX before joining the CRAZY - 5. Although FRITZ writing career did not last as long as many us, he did get up at the right time. Years later me, Fritz and Crachee would join a Disco band and tour through out New York. We had some great times. 10) Would you have any raid stories ( chase stories ) you can share with us? other way and I found a utility box an hid inside it. Unfortunately the friend that was with me got caught and we decided not to go to that station ever again. 11) What were your favorites places to hit on trains and why? My favorite places were 225 st lay-ups and 4 yard under Tracy Towers while there were being built. There was a worker named Curtis who wore a pair of dice around his neck. We used to cut out of school and bring him our lunch so he would let us in the yard and spend the afternoon there. 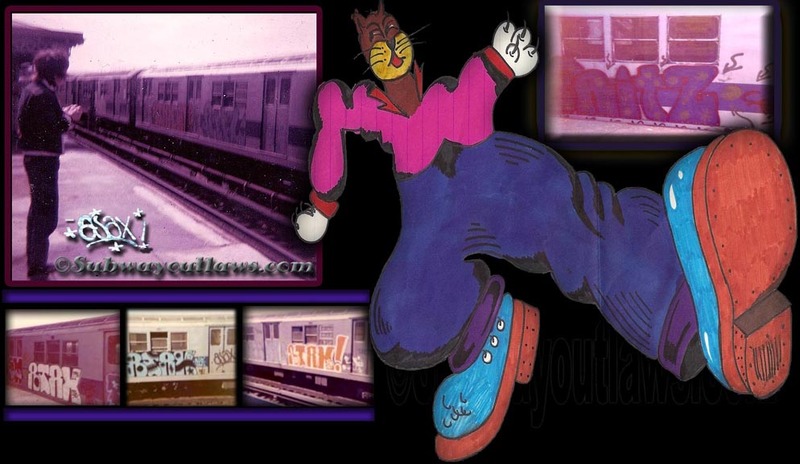 12) Can you tell us some of your favorite master pieces that you seen on the Subways? Tracy168's pieces were the ones I admired the most, he had some really nice work and as I'm sure you all know he got a job with a big name magazine. 13) could you tell us all the writers you have wrote with or painted with over those years and can you tell us who was the best writer you ever wrote with and why? The main guys that I wrote with in the beginning were NITRO, REBEL , DEVIL, SHAKE / SANTANA, AJAX, and COMET, The best writer I ever wrote with was probably Ajax, he always knew the right places to go to. 14 ) Have you ever been to the writers bench at 149th street to meet other writers if so what do you remember about it? 1 5 ) Who were in your opinion the top writers painting the Subways in your era? 16 ) What were your favorite master pieces you have done on the Subways and why? 17) When did you stop writing and why? I stopped writing in 1976 because I started playing in a band and it took up most of my time. 18) Would you have any closing words? The whole experience was a lot of fun, I made lots of friends who I still keep in touch with some I have seen and others that I havent have the pleasure to see lately. Thank you for the oportunity of letting me tell my story that brought back a lot of great memories. I wish there would be more I could tell you but its been over 30 and i can't recall everything. Good luck to all the writers of this era. P .S, > DON'T GET CAUGHT. ALL RIGHTS RESERVED. NO PORTION OF THIS BIOGRAPHY MAY BE REPRODUCED, STORED IN A RETRIEVAL SYSTEM OR TRANSMITTED IN ANY FORM OR BY ANY MEANS – ELECTRONIC, MECHANICAL- PHOTO COPY, RECORDING OR ANY OTHER – EXCEPT FOR BRIEF QUOTATIONS IN PRINTED REVIEWS WITHOUT PERMISSION OF THE ARTIST AND SUBWAYOUTLAWS. 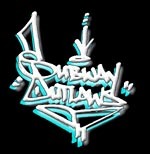 STAY HIGH 149, ALE and the team at Subwayoutlaws.com. Looks for Bio's of other CRAZY- 5 members, in the near future.